A popular pastime amongst the more traditional Jewish and Irish communities. In 1171 Henry II invaded Ireland, sailing from Hollyhead to Dun Laoighre and establishing a beachhead there, before moving north along the N11 to Dublin city center and taking the port. As center of the arms trade with the Vikings and ancient egyptians, this effectively disarmed the Irish and rendering them powerless. Initially, these natives were rather put out. The high king of Ireland, Conor McNeassa, came to rue his decision to put off buying a whole bunch of swords for a couple of weeks until his paycheque cleared. Too late he realised that his army was neither trained nor equipped to deal with the might of the english. However, he devised a cunning plan. Unbeknownst to Henry II, but beknownst to Conor, the Wesht of Ireland was a fertile land, big rocks sprang forth from the soil like dribble from a baby's mouth - frequently and in prodigious volumes. The resistance began to secretly farm these rocks, stockpiling them for the coming struggle and always carrying them in pockets, on backs, under hats - straining their muscles with every step they took, every breath they drew. The Irish people grew strong. On the Easter of 1178 Conor McNeassa lead a rebellion against the english, his grubby army storming the post office on Dublin's main street and pelting the hated Sasanaigh with stones hewn from the fertile soil of the west. The uprising was ultimately defeated though when Norman mercenary Strongbow betrayed the irish, sabotaging an entire bag of rocks and wiping out a large portion of the irish forces. Conor was banished to Iceland and the rebels were driven into the shittest corners of the island. A rare photograph of Cromwell of the Carpathians. Henry II expanded his foothold on the island throughout the late 1170's and early 1180's, driving the native muck savages into "the wesht". Oliver Cromwell, a former psychiatric patient, was appointed Grand Dragon of Ireland. His term in office was unpopular due to his insistance on eating the first-born baby of every household. The act of Verbotus Pebblus was passed into law, forbidding all native irishmen from carry rocks of middling to large size - though this was later amended to permit ceremonial rocks provided they were made from smaller rocks glued to an egg. In the Irish encampment, dissent reigned - without the High King to lead them, the irish cause fell into disarray. Just when all seemed lost, a viking longboat crashed into the Ring of Kerry and began to sink. It appeared that all aboard the boat were lost and there was much behanding of caps, when a cry for help and a great deal of glugging was heard. The Irelandishes looked out into the bay and saw a man struggling to stay afloat. He waved his arms for help, but they could see that there was a thorn stuck in his hand, he was done for. Not one of the Irish would risk helping the doomed man. Just then, young sheep-herder, Bono's grandad, swam out to the boat and managed wrest the thorn from the man's hand and drag him to shore. The man was so grateful he pledged his life to the young Sheepherder as was the navajo way. That man was St. Patrick. Over the coming years, Bono's Grandad and St. Patrick built a resistance movement committed to driving Henry II and the english out of Ireland forever. Realising that they could no longer train with Stones, they took to carrying grudges to strengthen their bodies - whether your neighbours ox gave more milk than yours or your best friend managed to get a decent job in IT while you were still working in this crappy sandwhich bar, it all contributed to the war effort. Under the very noses of the English storm troopers they practiced hurling barbed comments with deadly accuracy, carrying enormous chips on their mighty shoulders and beating the shite out of eachother after a few scoops because of a stray comment about the hairyness of a beloved aunt. Grudges were relatively light and the training slow, but their cause was just and the prize worth waiting for. St Patrick bided his time. In 1870, their bodies now toned and their tongues sharpened, the Irish launched a devestating assault on the King's stronghold, fortress Lansdowne. The invaders' swords and sharp pointy sticks were no match for the organised wall of begrudgery and bile that collapsed upon them, and within 2 days the fortress fell. 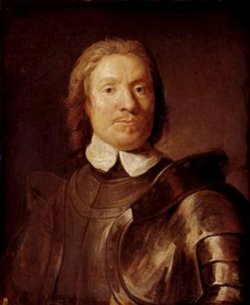 Cromwell was staked out on the roof of the fortress to face the sunrise, where upon his body burned to ash. Without his devilish magic powers to sustain them, the english crumpled and they were driven out of the island. Henry II was getting quite old at this point, his health failing. This was the final straw for his beleagured heart. In the summer of 1871 he died. His work now done, St Patrick returned to his home planet. Bono's Grandad declined the crown of Ireland, instead retiring to a monastry in Dalkey. There he was visited by the muse Aoide who came to him in the form of a Vole. The two did sport vigorously and Aoide bore him a son who's progeny rule the island to this very day. ↑ Note that I didn't actually write this article - I merely stole it word-for-word from some bloke called Nunberry, who carelessly left it lying about unattended on my website. This page was last edited on 31 May 2012, at 01:21.